Pay: what went wrong in 2007? Libcom's analysis of what went wrong with the industrial disputes over the rising cost of living in 2007, and how to do things better in 2008. A 'Summer of Discontent', Gordon Brown preaching pay restraint, union leaders talking about 'co-ordinated strike action', sound familiar? It should, because exactly the same things were being said last year. Despite some brave attempts in 2007, the working class suffered yet another profound defeat, unable to assert its own interests against both the bosses and their own trade unions - who did deals behind closed doors, ignored strike votes and dragged on consultations and negotiations for months. Just like this year, 2007 started with a 2% cap on public sector pay rises This led to a wave of strikes, which while some were impressive, many were stopped before they even got started and most failed to make any gains on either pay or other issues. To reverse this trend, we need to understand previous failures and learn from them in order not to repeat the same mistakes over and over again. In Royal Mail, strikes got off to a good start in July, rolling strikes and a work to rule caused a massive backlog, then later sparking wildcat strikes across Scotland and the North of England. 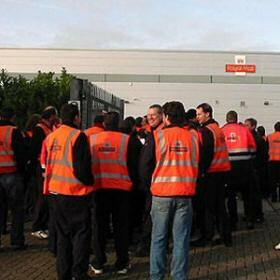 As the second wave of official strikes was due to start, they were called off by the CWU leadership, entering 'meaningful negotiations' with Royal Mail management. These 'meaningful negotiations' lasted for weeks, came to no firm conclusion (except that measures would be forced through at a local level where it's easier to divide the workforce), and prepared the stage for a fresh assault on pensions this year. Strikers in Liverpool who had continued with unofficial action were left out on a limb - spending many days without pay as the CWU refused to release details of deals done for fear of a massive negative reaction from elsewhere - with the workforce in most places demobilised by a slow and agonising wait. There were also strikes by 200,000 civil servants, significant local strikes by health and local government workers in Manchester, Glasgow and Birmingham, and in the public sector, official and unofficial strikes by thousands of workers at Grampian foods, Coca Cola, Heinz and smaller workplaces. So with hundreds of thousands out on strike, and workers taking their own initiative in some sectors - how come this didn't lead to the 'pay inflation' we were warned about and so desperately need? Let's face it, pay inflation's about the only kind of inflation we don't have at the moment. First we need to look at what was promised - coordinated strike action between public sector unions, 'prolonged and sustained strike action' on ballot literature. And what we got - strikes cancelled at the slightest hint of a deal, strike votes of 51% being rejected as not enough of a mandate (while this year 54% is a resounding mandate, maybe 3% really does make a big difference! ), pay deals of 2.5% over one year being magicked into 5% over two years (or even less) - oh great! Despite all of us facing the same attacks on our wages, on our working conditions, on our weekly shopping bills - we're sliced up into a million separate issues, ballots and campaigns. So how do we respond to this? Certainly not by appealing to the union leadership or the government! While the right wing press (pretty much all of the press), complains about Labour's close ties to the unions, they fail to mention the unions' close ties to labour - it's a short jump from trade union leader to cushy ministerial position or a fat pay check sitting on a QUANGO, and that's where their interests lie (since their wages go up regardless of whether ours do). Trying to replace leaders or 'democratise' the unions is another old game that was bankrupt even when union membership was a lot higher and a lot more militant - it either burns people out or catapults them into the same positions and compromises they attacked moments before. What's needed is independent activity outside these structures - co-operation of workers across the boundaries of union, sector and the public/private divide. The bosses are simply continuing a coordinated attack that's been going on for decades - they're quite able to put on a united front when it comes to keeping wages down, hours long and prices high. But they're met with piecemeal resistance by workers divided by artificial boundaries and operating within a framework set entirely by the opposing side. Even a small number of workers can have a big effect if they're able to break out of these restrictions - taking their breaks, leaving on time, organising go-slows, producing leaflets, walking out in defence of colleagues who are being victimised - without waiting for people who've got no interest in our situation except its continuation to give them permission.